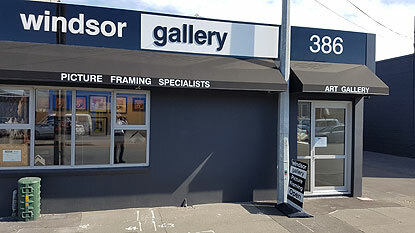 Windsor Gallery held in the highest regard, having been committed to its customers for more than a century. It was located in High Street for much of that time, but with city changes it has found a great new location at 386 St Asaph Street with off street customer parking. 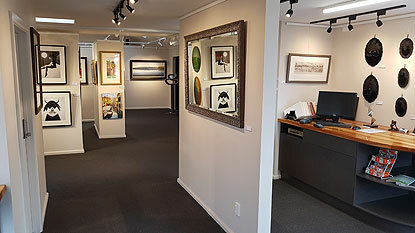 A dedicated consultation area for selecting custom framing you can be proud of leads through to a bright modern gallery space with striking portraiture through to nostalgic and incandescent landscapes and beautiful sculptures. The large workshop is able to handle substantial corporate framing work from large clients as well as domestic framing. At Windsor Gallery we like to spend time with our customers to ensure their investment in framing choice accents their piece of art to perfection. Our staff are knowledgeable and skilled framers providing a final product with a high quality framing finish. We want to know that every customer who leaves the shop is happy with our work and will be happy with it every time they look at it. We offer multitudinous picture framing options characterised by quality and sophistication and a range of glass that caters from standard glass through to reflection free and UV protection safeguarding an investment against the ravages of time. The Artists exhibiting in Windsor Gallery range from Emerging Artists to Established Acclaimed Artists from around New Zealand. Our Artists work in a variety of mediums: oil, acrylic and water colour paintings, mixed media, charcoal, pencil, photography, ink, pastels. Sculptures in bronze, clay, Oamaru stone, stainless steel , glass and marble are exhibited. We change the Artwork on display frequently and also have artist exhibitions throughout the year. We have a wide range of quality Giclee prints available and often source particular requests for prints for our clients. Join our database to be kept up to date with future artist exhibitions.